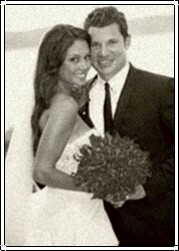 … their wedding took place on July 15, 2011, on Necker Island in the Caribbean. The host of “Wipeout” wore a two-piece Monique Lhuillier ensemble featuring an intricately embellished lace corset with rose and crystal detail, paired with a signature hand tufted skirt made of silk faille. The look was completed with a tailored bow belt at her waist and chapel length tulle veil. “I probably had half a dozen fittings and I was just so lost,” she tells PEOPLE of searching for the perfect gown.